Band members: Marrjarra Pascoe, Ben Pascoe (lead guitar, lead vocals), Terry Pascoe (bass, vocals), Wayne Kala Kala (drums), Horace Wala Wala (didjeridoo, vocals, tamborine, clapsticks), Kenny Smith (guitar), Jimmy Djamunba. 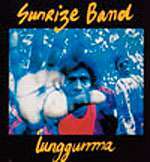 The band's name is often misspelt as 'Sunrise' instead of Sunrize. The Sunrize Band's name comes from the Aboriginal Dreamtime legend which sees the two women creators emerging from where the sun rises, where they made the rivers, the creeks, the people's traditional names, ancestral beings and Aboriginal totems.